Stir together water and sugar in a small saucepan and heat up until sugar is dissolved and the mixture thickens. Remove from heat and set aside. Add salt and egg white to a mixing bowl or the bowl of a stand mixer and beat until white and fluffy. Add sugar syrup little by little and continue to beat until stiff peaks form and mixture is glossy. Afterwards stir in gelatin powder. Transfer meringue to a piping bag and let rest for approx. 5 min. Pipe merinuge into cap-shaped mounds atop wafers and let rest on a wire rack set over a baking sheet for approx. 20 min. Chop chocolate. Set up a double boiler by placing a heat-proof bowl over a saucepan of simmering water. Melt chopped chocolate in heat-proof bowl and stir in coconut oil. Remove from heat and let cool until lukewarm. 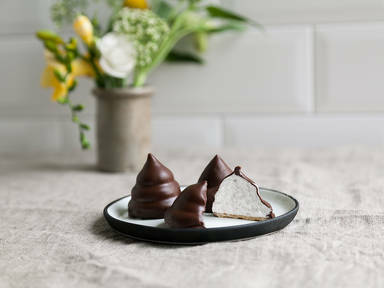 Pour chocolate over meringues carefully until they’re evenly covered. Refrigerate mallomars for approx. 20 min. and enjoy cold!